Saturday morning around my house consisted of getting up, turning on the coffee pot, grabbing my iPad and tuning in to see if we were looking at 6 more weeks of winter or an early spring. Well, that "Weather Prophet without Peer," Punxsutawney Phil, did not see his shadow and was returned to his burrow to enjoy the next 365 days until he's called upon again to make another forecast. Honestly, Phil's got a great gig: he only has to forecast once a year! The idea of an early spring isn't a surprise to most of us as it was a dry and warm January (average temperatures ranged from 4˚F to 8˚F above normal across the state), some plants had already started budding, and everything seemed to be covered in a nice yellow blanket of pollen. The Climate Prediction Center (CPC) predicts normal temperatures for the state, and they are also predicting below normal precipitation in the western Panhandle and north Florida through April. At the beginning of January, I packed my bags and headed to the Lone Star State to attend and present at the Annual Meeting of the American Meteorological Society (AMS). Sadly, I did not have room in my bags to bring my rain gauge, but luckily enough, members from CoCoRaHS HQ in Colorado remembered to pack some for the annual WeatherFest event that was held the Sunday before the meeting. The event allows people from the surrounding community to come and experience a variety of interactive weather and science exhibits, and CoCoRaHS has been part of WeatherFest over the last few years. We featured our 'How Much Rain Can You Squeeze from A Cloud?' 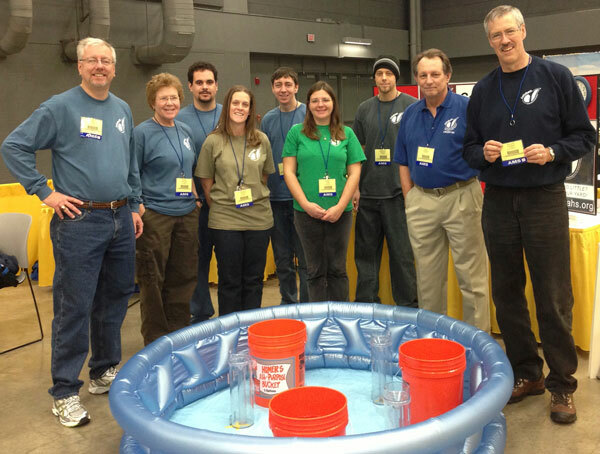 game again this year as a fun, interactive, and somewhat competitive way to educate attendees how to read a rain gauge. Everyone had a great time, as we had national, state, regional and local coordinators from all over the U.S participate. We were lucky enough to have some observers from the Austin area come and volunteer throughout the day and were even allowed to put out a rain gauge at the convention center during the meeting. 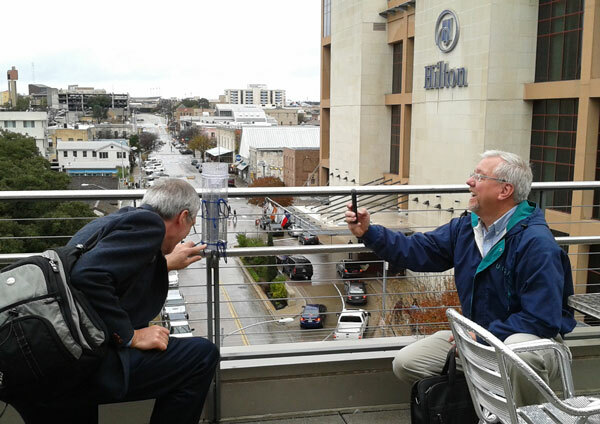 Nolan and Henry checking the rain gauge after overnight rains in Austin at the convention center. After hearing some suggestions from observers, we've decided to open up the Florida CoCoRaHS Facebook Page so that you all are able to post stories, pictures, or ask questions directly on the wall. I will be monitoring the content that is posted to the wall, meaning that after you've submitted a post, I will have to go through and approve it before it will appear. This way, I can make sure that only relevant stuff is posted and nothing that would be seen as inappropriate makes it way on our Facebook Page. If you have any questions, please feel free to contact me. "A line of thunderstorms moved eastward into the western Florida Panhandle before dawn February 1 and continued southeastward through the entire state exiting the southeast coast and Keys around sunset February 2. 18 Tornadoes occurred along with sever thunderstorm downbursts, hail and heavy rain. No extensive flooding was reported although short-lived local flooding was observed. Four people were killed along with several (~32) serious injuries requiring hospitalization, and about 200 people were left homeless. The Orlando area in Orange County of Central Florida probably suffered the most extensive property damage probably because it was the most urbanized area to be hit with severe weather." This was one of the most widespread tornado outbreaks in Florida. 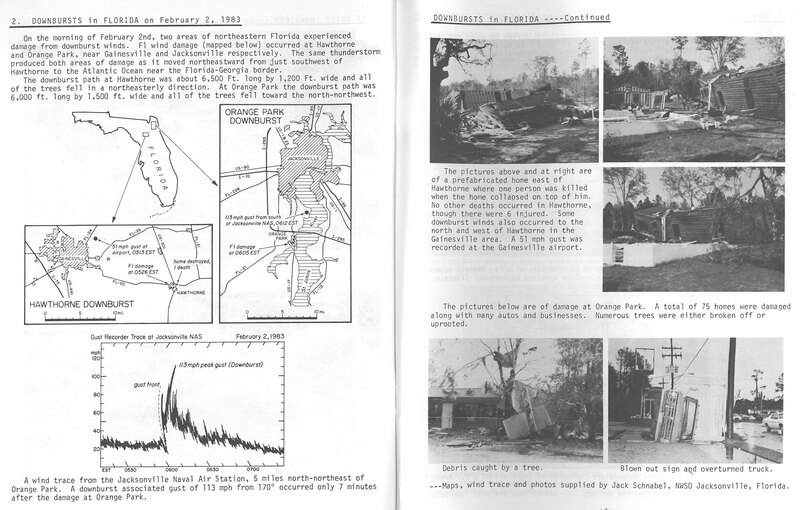 I've scanned in a copy of the pages from the writeup on the downbursts in Orange Park, FL, and Hawthorne, FL, so that you all can read the narrative and see some of the impressive graphics and pictures that were included in the NCDC report. 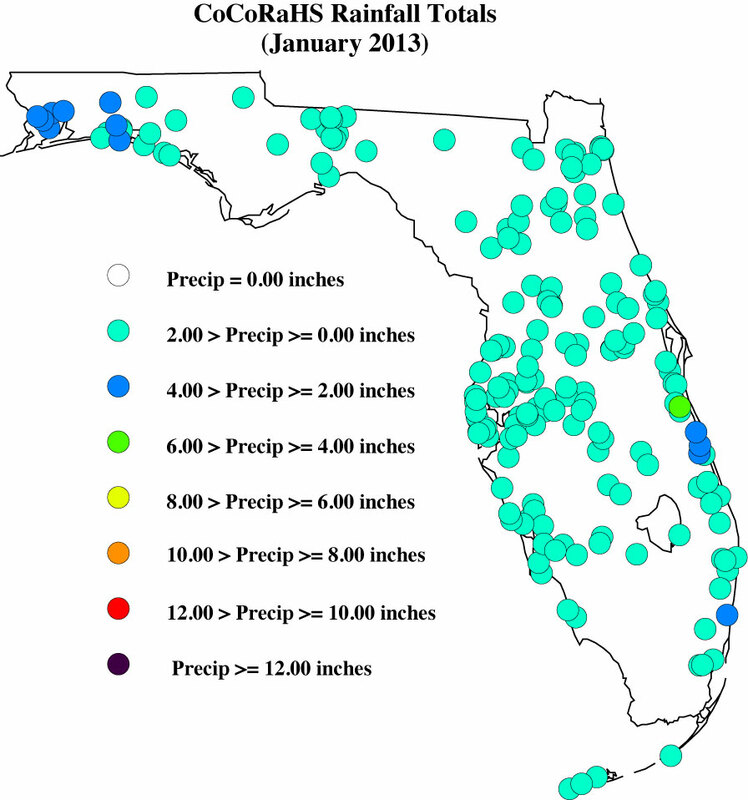 Rainfall totals across the state were below normal in January (Table 1), with the northern part of the state reporting 3 to 5 inches below normal rainfall, while portions of the peninsula and south Florida were 1 to 3 inches below normal precipitation (Figure 1). 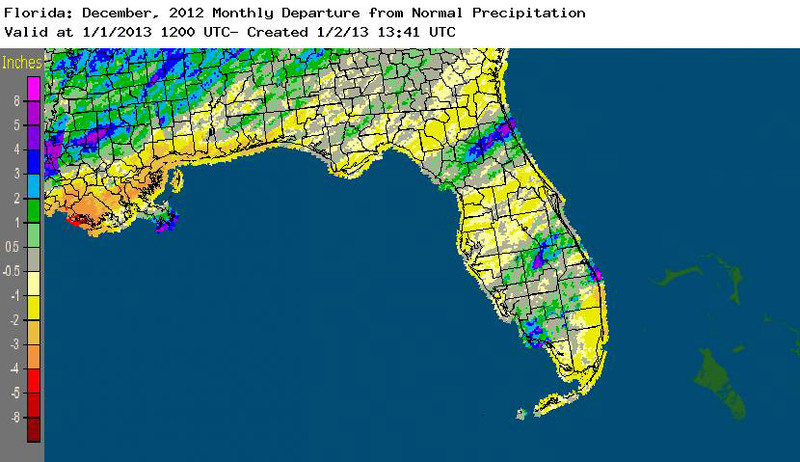 January 2013 was the 5th driest on record for Gainesville and the 8th driest on record for both Orlando and Tallahassee. Only a few precipitation records were broken in January, and only one of those records was for a rainfall total over 0.50". The below normal rainfall has already raised concerns for the upcoming wildfire season and worsening drought conditions across the state. Table 1: January precipitation totals and departures from normal (inches) for select cities. Here are the CoCoRaHS rainfall totals for January from some select CoCoRaHS stations across the state. Statewide rainfall totals were roughly 25% of normal over the last few weeks, causing negative effects on drought conditions in the state. Many rivers across the state are reporting below average stream flow levels. 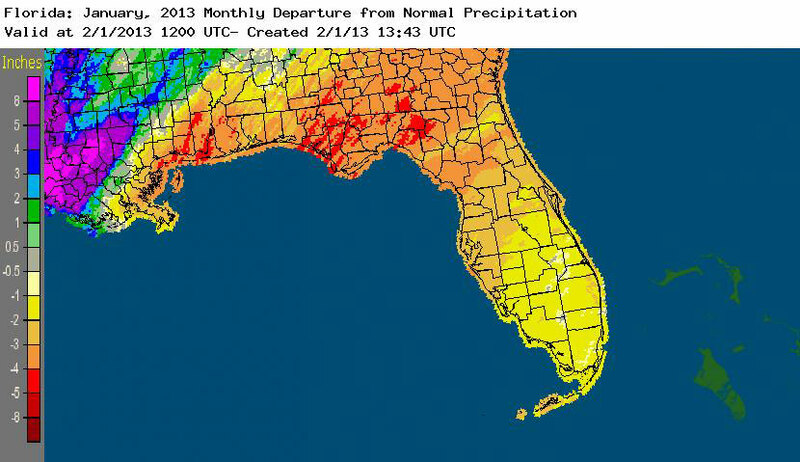 Winter is an important recharge season for portions of north Florida (the Panhandle and the north part of the peninsula), while south Florida is typically dry during the season. Due to the below normal rainfall totals, the area of dry/drought coverage expanded from about 43% on December 25th to roughly 90% as of the January 29th release of the Drought Monitor. The biggest changes were seen in the Panhandle and especially along the state lines between Florida and Alabama/Georgia. 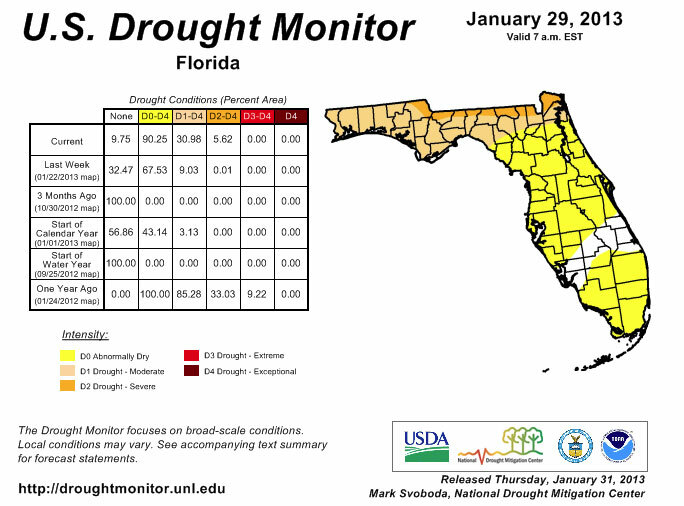 Most of the area north of a line from the Steinhatchee Conservation Area to St. Augustine is listed as having moderate drought conditions (D1), while along the state line, conditions are worse with severe drought conditions (D2). The peninsula has not escaped the deteriorating conditions either. Only a few counties (Charlotte, Lee, Glades, Highlands, Okeechobee, Indian River, St. Lucie and Martin) still have areas that are not listed as experiencing dry conditions. A few reports in Florida were flagged and required some additional information during January. I appreciate how understanding the contacted observers were, along with how quick they were to reply to my emails, though there are a few outstanding issues that need to be resolved. Please remember: if you receive an email from me with the subject line 'Question About Your Recent CoCoRaHS Observation', please take a moment to answer me back. And if you have any questions, please feel free to contact me.